Venezuelan President Hugo Chavez had accused RCTV of supporting a botched coup against him in 2002. Caracas, Venezuela (CNN) -- Venezuelan cable television providers dropped a channel Sunday that has been critical of President Hugo Chavez, citing violation of broadcast laws. Radio Caracas Television, which lost its broadcasting license in 2007 and became a cable-only channel, disappeared shortly after midnight on Saturday. RCTV was the only station that did not air the entire speech of Chavez during pro-government marches earlier on Saturday. Diosdado Cabello, director of the national agency regulating electronic media, had called on cable and satellite providers to stop offering channels deemed to be in violation of the law. Cabello said RCTV did not broadcast the Venezuelan national anthem as required and failed to provide warnings before programs featuring violence. The channel denied the violations in a news release Sunday. It said the move to drop it was illegal and questioned the National Commission of Telecommunications' authority to regulate subscription-based TV. The government "illegally targeted the subscription services by asking them to exclude RCTV International's signal," according to the statement from RCTV. The action by the regulatory agency is illegal because "if the government believes that RCTV International has committed an infraction, what follows is to open an administrative complaint against the channel, giving RCTV International the opportunity to defend itself, as the constitution mandates and guarantees," RCTV said. Five other channels were also taken off the air, according to the Venezuelan Chamber of Subscription Television. They were Ritmo Son, America TV, Momentum, American Network, and TV Chile. The chamber's president, Mario Seijas, said the organization's position was to comply with the telecommunication rules that are in place in Venezuela. Chavez has accused RCTV of violating broadcast laws and supporting a botched coup against him in 2002. Before it lost its license in 2007, it had been on the air for 53 years and was one of several private broadcast stations that openly criticized the government. 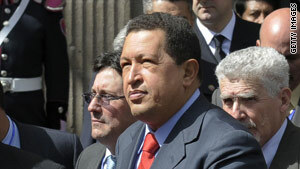 Relations between Chavez's government and private broadcasters have been tense. Last year, Chavez closed 32 privately-owned radio stations and threatened to close more than 200 others for a variety of infractions, including working with expired permits and operation by unauthorized personnel. The Venezuelan government says the closures are an effort to get all broadcasters to abide by regulations that are on the books, while station owners say the closures are politically motivated. The moves against the media have worried organizations that defend freedom of the press, as Chavez has also expressed support for legislation that would mandate prison sentences for people who commit "media crimes."